ALL but the most disadvantaged Australians will be hit by a big tax rise as the Government uses the Budget to regain ground on health spending. The Turnbull Government announced the end of the troublesome Medicare rebate freeze which has been forcing up the cost of GP visits and threatening the spread of bulk billing. But it also introduced plans for an $8 billion tax increase phased in over four years through the Medicare levy to pay for disability insurance. And in recognition of the pounding on health policy it received at the election last year, it wants to legislate a Medicare Guarantee Bill with a Medicare Guaranteed Fund to cover all expenses of the scheme. Are you glad to see the Government lift the freeze on Medicare rebates? Yes - it will give GPs more incentive to bulk bill which is great news. No. It won't stop some GP's from being greedy and upping the costs. My feelings are mixed. It'll be great if going to the doctor is cheaper, but I'm not sure about having to pay an increased Medicare levy. 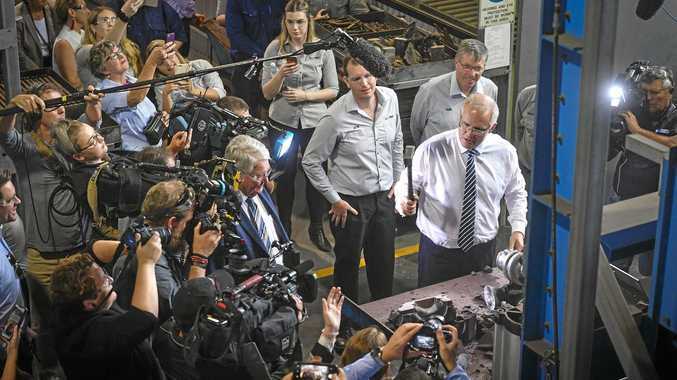 The Budget delivered by Treasurer Scott Morrison also outlined a massive $75 billion infrastructure splurge over 10 years, including the Commonwealth's outright purchase of Snowy River Scheme from NSW and Victoria. Tax revenue will rise by more than $20 billion but Mr Morrison said the only people paying increased tax rates from July 1 will be multinationals and major banks. Our wealthiest banks with be hit with a special 0.015 per cent levy on liabilities to raise $6.2 billion over four years. Housing investors will have to pay more. Contrary to longstanding rejection by the Government, it has altered negative gearing provisions to bar tax refunds for travel to investment properties, and for removable purchases such as dishwashers. And Mr Morrison officially scrapped $13 billion in so-called zombie Budget measures hanging over from the 2014 and 2015 budgets. They were never going to be passed by the Senate but their existence made the Budget bottom line look better than it actually was. 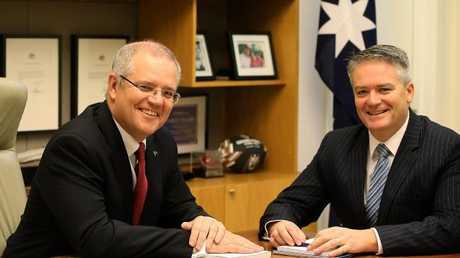 Despite boosted outlays, the Treasurer promised a $7.4 billion surplus in 2020-21 with no borrowing for recurrent spending, which cover the day-to-day bills from running the government. Borrowing would be limited to spending on capital works - infrastructure counted as assets and thus removed from debt calculations. Australia will soon owe markets more than half a trillion dollars in gross debt. Mr Morrison argued the infrastructure spending - so-called good debt - should not be included in calculations. "The Budget papers show, after you take into account the net operating balance, infrastructure grants and non-cash accounting provisions, the Government will no longer be borrowing to pay for our everyday expenses from 2018," Mr Morrison told Parliament. And he gave a rosy forecast of improved circumstances and for households facing rising living expenses and stalled wage growth. He said pay packets were set to rise by three per cent over the next four years while the national economy would expand by three per cent in the coming two years. "And it's been a fair while since most hardworking Australians have had a decent pay rise, " Mr Morrison told Parliament. "I know this has put real pressure on Australians and on their families. Terribly, this has meant some families have even broken apart. "I believe, though, that we are now moving towards the end of this difficult period." Running parallel to the Government's nation-building programs is the concentration on health, with a $10 billion spending increase over four years, in part to counter the risk of Labor again use the policy area to attack the Coalition. And the big element will be the 0.5 per cent increase in the Medicare levy to be paid by all singles earning $21,655 a year and above, and couples on $36,541, with additions for dependent children. Mr Morrison last night argued "quite a top up" was needed to sustain the National Disability Insurance Scheme, which could have a $55.7 billion funding shortfall over the next 10 years. The Treasurer argues there is no other feasible way of paying for the scheme, and says now is the time to stop debating how to pay for the NDIS and just do it. The Medicare Guarantee Fund will be more than the Government demonstrating a commitment to the health scheme. It will also improve the Pharmaceutical Benefits Scheme which subsidises medicines. "The bill will provide transparency about what it really costs to run Medicare and the PBS and a clear guarantee on how we pay for it," said Mr Morrison.